I use the words: feedback, review and critique interchangeably to mean the same thing in this article. I love getting critiques. It makes me feel acknowledged and important. Someone took the time to think about my work and give feedback. What a precious gift. An online writing group is the place to learn how to take and use criticism in a supportive environment. Criticism is the bane of every writer, but a novice is much more vulnerable. An unthinking, harsh review can discourage so badly, the writer may give it up right then and there. The writing group you choose should be helpful and nurturing. Criticism should be honestly encouraging along with being honestly helpful. If you find no encouragement, find another group as quickly as you can. Don’t be discouraged if you feel you received a negative critique. If your work were totally hopeless, you probably wouldn’t have gotten a critique at all. The reviewer cared enough to spend time on you – that’s a good sign. A review is not negative just because it contains a lot of suggestions and corrections. It is negative only when it contains no encouragement and doesn’t point out the good areas. There are always good areas, and they should be expounded upon too. 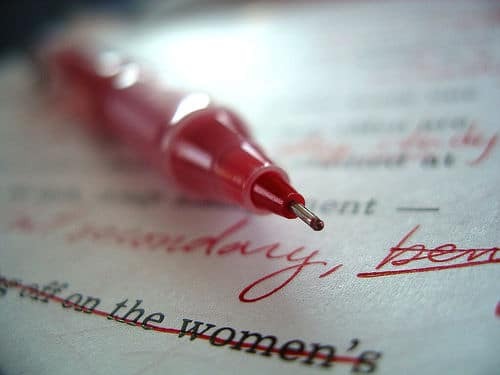 Before revising a second draft, take some time away from your work, then pull it out and think long and hard about each comment. Some things that you may have assumed were clear may not be. Other things may be awkward or incorrect. You are so close to your work and emotionally wrapped up in it that you will naturally miss things. Your reviewers have no such ties – they can help you view your work from a fresh perspective. Pay attention to recurring comments. If more than one person is noticing a potential weakness, you know you’ve more work to do. Don’t be afraid to ask for clarification of a comment. And don’t think you are obligated to use the suggestions. Just be open to other solutions – they might not be appropriate for one story, but they might spark other ideas. This is your work, but think of what’s best for the story. If you are constantly feeling under attack, perhaps you’re not ready for critiques. Is it what they said that upset you, or the way they said it? Are they using rude words to describe the flaws or are you just not interested in any negative comments? Or worse, are the reviews always positive and vague, giving you no useful information? Perhaps they don’t even tell you what you did right? If you are looking for only praise from your readers, you may not be ready for reviews. There’s nothing wrong with this, we’re all at different stages in our writing confidence. As your desire to write grows, you will soon progress to that next stage, and welcome the feedback. In the meantime, reading and offering your help to others is the next best thing you can do for your own writing. Giving and receiving feedback makes you aware of the basic rules of good English use. If you think you don’t need to worry about grammar, spelling, punctuation, rhythm, focus, syntax, and structure, think again. They are the key to clarity. Writers want to make sense. They want to take the reader into their fantasy world and make them believe. Learn the rules. Break ’em later. The best rules can’t be taught or put into an easy list, but you can learn them by reading excellent writing. If you know what works, you’ll strive to emulate it. It’s also good to review bad writing. You’ll find that you’re learning and hopefully avoiding the same mistakes. How a writer responds to the comments of reviewers will likely determine how he responds to prospective editors and agents. Editors aren’t concerned too much with your feelings. They will rarely comment on submissions. If an editor doesn’t understand a story he simply sends a rejection letter. Think of the reviewer as your future editor, and listen closely to what they say. They aren’t always right on their technical advice, you need to learn the rules yourself, but their views on the content are views of your future readers and buyers of your book. If they are your intended audience, pay attention. Feedback provides the writer with something he or she cannot get for themselves: reaction to the piece by someone who doesn’t have these characters and their world in their head, someone who doesn’t know this story inside-out. That’s the beauty of feedback.